Coach's Corner - Boston Celtics "HOF Greats" group signed "Fanatics" trophy. Go Back to Lot List Boston Celtics "HOF Greats" group signed "Fanatics" trophy. This stunner is a free standing, well designed trophy from Fanatics, and comes in the original box. It is about 16 inches tall, honors the storied franchise for their 17 world championships, and comes hand signed by 5 in bold black sharpie. 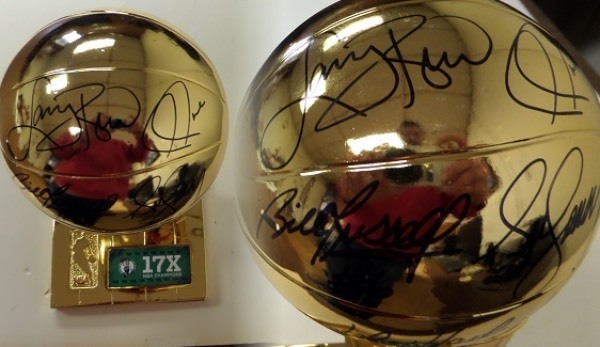 I see signatures from Bob Cousey, Larry Bird, Paul Pierce, Bill Russell and John Havlicek. It is a 10 all day long, and value is $1200.00 with Russell appearing.